Many who now have nodes setup and linked are wondering "NOW WHAT???" Here is an example of setting up something to talk across your mesh. First, you need to have at least 2 nodes talking to each other. If you have SIGNAL/NOISE/RATIO values, then you have at least 2 nodes talking. If it says N/A, then the nodes cant see each other yet. Try repositioning the node, adding a reflector or two ( http://www.freeantennas.com/projects/template2/index.html ) , or maybe you might need another node in between to help bounce. Thats EXACTLY what we had to do, was I moved K5KTF-101 closer (out in the workshop) to FZU's QTH, AND made one reflector from that link and slipped it on one of the -101 antennas, pointing towards his house. Once that is verified, now you need to have stuff talk over the mesh. So lets say you have 4 nodes. We will use mine and my neighbor's, KA5FZU, as an example. We actually JUST got this working between his QTH and mine last night (8-19-2010). 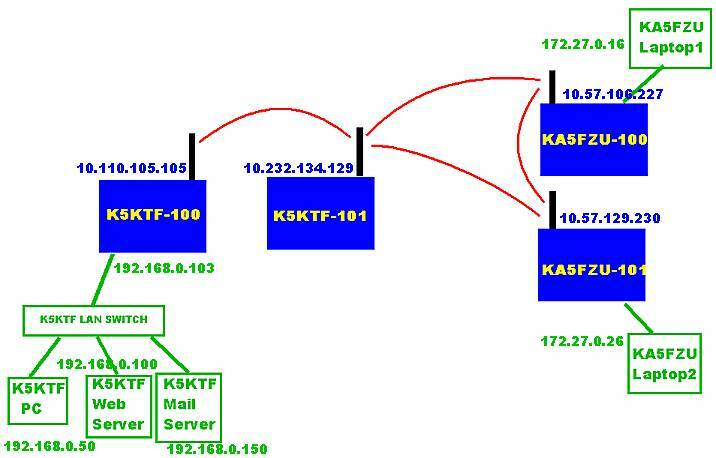 If you study the diagram above, you will notice TWO different sets of IP addresses. The ones in blue are the WLAN IP's, or the IPs for the wireless connections. The IP's in green are whats behind the node, either statically set or DHCP (handed out by the node). Straight lines in green are cat5 cable connecting devices. The red lines are the different wireless connections made between nodes. Of course, I have to have my web server listening on port 80 and on the LAN, but that is a totally different subject. Email me privately for help with Apache. 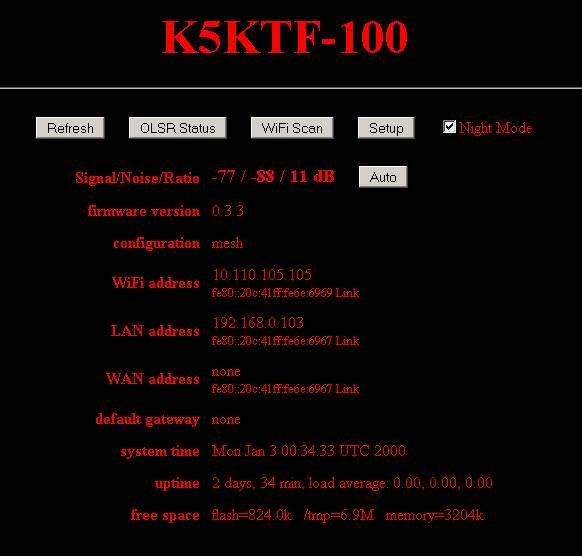 Once the port is mapped, then FZU would get onto either of his laptops (since they both can see K5KTF-100 through K5KTF-101 and his nodes), and he would enter in the IP address of K5KTF-100 ( http://10.110.105.105/ ) and NOT the 192.168 IP address, or any of the nodes in between. Your "target IP" will ALWAYS be the WLAN IP of the node that the target is connected to. As you can see from the above port-mapping picture, I also mapped ports 110, 25, and 587 to my email server. Those are the 3 common ports used for email. If FZU was to add a new account to his email client (Eudora, Outlook, Thunderbird, etc), if he used K5KTF-100's WLAN IP (10.110.105.105) as the POP and SMTP servers for that account, he could send and receive email through my mail server across the mesh. Once on my mail server, it would go out the public network (internet) to whereever it needed to go. But that keeps the mesh OFF the public internet, but still allows mail to flow from inside to out. 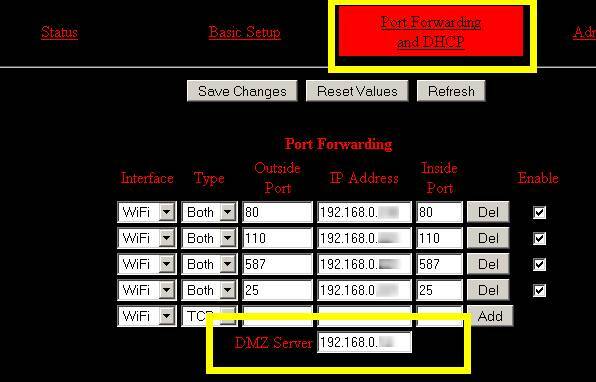 On the port mapping page on K5KTF-100, I put MY personal PC's private lan IP in the "DMZ" (demilitarized zone, which means anything trying to hit a port NOT already mapped above, will go to that IP address). 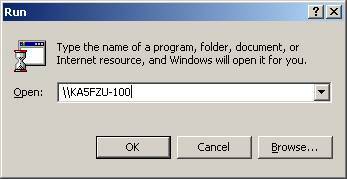 I also had to add an exception to my Windows firewall, to exclusively allow KA5FZU-100 and -101 IP addresses, to allow him to use Windows networking to get into my PC. I already had shared folders setup on my PC, so I didnt have to do anything extra. HE on the other hand, created a special folder called "Mesh Dropped Files" and shared it. Then we added his PC's IP address (the 172.27.0.x IP) to the DMZ on his nodes. Then, to get TO each other's PC's, you would do a START, RUN, (or WIN key and R) and type in \\ and the TARGET WLAN IP or the TARGET node name, and click OK.
That pops up a Windows Explorer window showing any shared files/folders/printers on that PC. If I opened a second Explorer window (by holding down the WIN key --to the left of the spacebar between CTRL and ALT on most PC keyboards-- and tapping E), then I could drag and drop files between the two windows, copying files across the mesh. Add the LAN IP of the node (192.168.0.103 in my example) as your secondary/alternate DNS server (Control Panel, Network Settings, LAN Properties, IP (V4 if needed) Properties, and the 2 DNS servers at the bottom). Then, while in there, click the ADVANCED button, DNS tab, and check the "Append these DNS suffixes" box and then add "austin.tx.us.mesh" (without quotes) to that section. OK all the way out, and maybe reboot to make sure all settings jive, and it should all work. I hope this article has helped clear up issues you may have trying to run things over a mesh. If you have any questions, feel free to email me (jim at mycallsign dot com ) and I will try my best to assist.